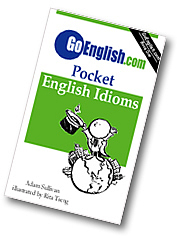 Today's Idiom = "In Over Your Head"
The analogy is to an unskilled swimmer who has fallen into water that is too deep. You are in over your head when you face a challenge you are not able to meet. @"The new PR Manager felt like she was in over her head during her first week at the new job." "Over one's head" refers to the depth of the situation one is in. The situation has become more serious (severe) than the person is prepared for. Example: "Go ahead and lead the meeting today; I'll help you out if you get in over your head."